"The front glass panel helps to add deeper color and picture depth." Sharp's 2nd tier 4K TV for 2015/early 2016 contains a generous combination of features and quality. The difference between the Sharp UE30 series compared to the higher end UH30 series that the UE30 sacrifices THX certification, a nicer front panel, and touch pad and voice search remote control in favor of a more reasonable price tag. Both have Sharp's new Ultra Thin design, Revelation upscaler, a Quad-core processor, and Aquo Dimming though there are more zones on the UH30. 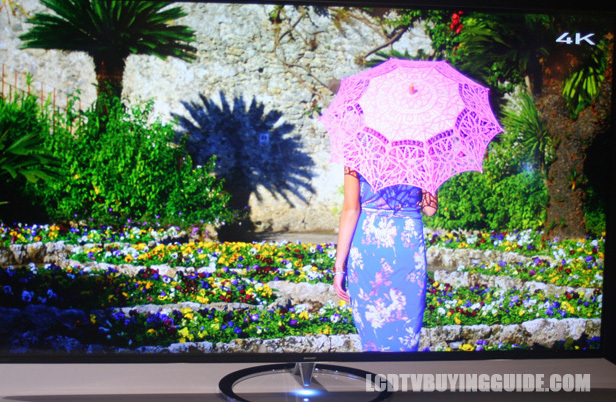 Both also have the upgraded Android TV Smart TV platform. There are several upgraded picture quality features including a glass front panel rather than the typical plexi-glass that helps add deeper color, and picture depth. Another of great import is the Revelation Upscaler. Without the ability to upscale 1080p and lower resolution content well, you would not currently even want to purchase a 4K UHD TV because there is such limited 4K content available. This is the job the Revelation Upscaler performs, and it does it well. While we've never been extremely impressed with with local dimming features (other than Sony's ultra expensive models) the new Sharp Aquo Dimming feature does add some contrast and help define color information. We typically recommend this feature be kept to the off position. It's a clear motion enhancement feature that is fine for reducing motion blur and judder during fast sports action. 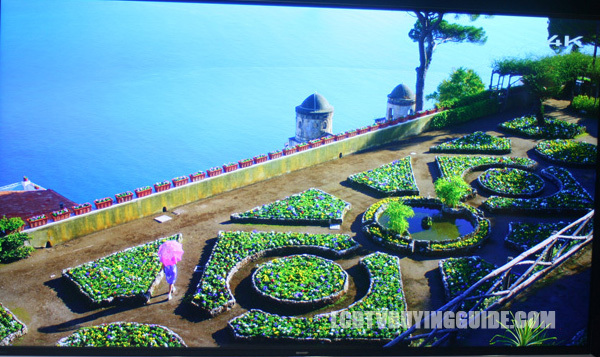 However, during film or broadcast content it can interfere with the natural background blur on-screen in such a way that it produces a non-realistic picture quality – a kind of kitchy cutout effect of images in the foreground. Off center viewing quality begins to degrade around 30 degrees off center. This is a very respectable result although still a drawback compared to OLED or Plasma technologies. Even though it does not have the higher end remote control available on the UH30 series, the included upgraded Android TV has fast navigation and load times and is easy to use. 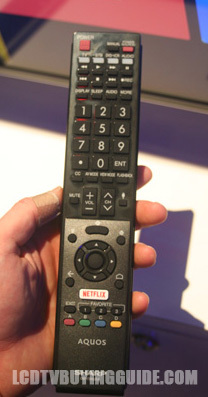 The small Smart Central button on the remote takes you directly to the Internet TV settings. The menu that pops up initially includes the Google Play, Vudu and You Tube options as well as many more. 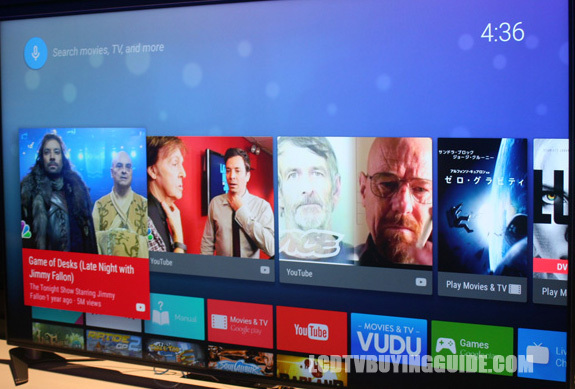 The new Android TV options are especially appealing for the gamers through Google Play Games. If you prefer to use your Smart Phone or Tablet as your control option, it is probably available for Sharp's 3.0. As well, you can share content from the smart device with the screen without much trouble. Via the Smart device option, a QWERTY keyboard is available to speed search function. Much better than the 5-way control on the remote. Sharp's Ultra Slim Bezel Frame is included on the UE30. Sharp does a nice job of keeping it simple as always and forgoes the curved screen for a good-looking efficient design with a very small frame footprint of around a half inch in black or charcoal gray. "Sharp has top quality reliability ratings and we expect this trend to continue in 2015/2016." We always like to mention this underrated quality category. Sharp has top quality reliability ratings and we expect this trend to continue in 2015/2016. What does it matter how good your picture looks if the darned thing poops out on you and develops a problem with the picture, sound, or remote function? Sharp's Japanese attention to detail yields best in class reliability – a point not to be ignored. We put Sharp and Sony tops in this category for consistently outperforming peers in panel life. We think the LC-60UE30 is a competitively priced model given the features and picture quality. Prices initially hit the market at around $1900. The upgrade to the UE series is worth it for an extra couple hundred dollars. The Vizio P-series 4K TVs, and Sony's X850C series may be the closest comparision. Sharp's up-conversion technology is better than most, and we feel you get an very quality package with the UE30.